My favorite pizza restaurant in the city right now, thin-crust or otherwise – parking after 6pm is generally ample, the pizza and other food is great, the drinks are on point, and it’s a nice, industry loft space to hang out, particularly from the second floor looking down. Getting a reservation with Open Table on the day-of also isn’t particularly difficult, especially during the workweek. By now, I’ve been at least five times, so it’s about time I jotted some thoughts down about Zero Zero. During my latest visit, with S, “Man Alive” and their friend, JY (also funemployed at the moment), I had another great meal. Because the menu seems to change from time to time, according to the seasons and what is locally available, there seems to always be something new to try. The time before, I tried one of the pastas – perhaps the cavatelli, sausage and broccoli rabe? – which was also delicious. On my latest trip, we started with one of the bruschettas and a ravioli-like stuffed pasta. The bruschetta, topped with artichoke, wild ramps and ricotta was particularly great – the bread toasted just right, and the ricotta giving it a nice creamy texture. Because S and I had a bit of a boozy adventure the previous day – starting with mimosas at Mission Beach Cafe and ending with Bloody Mary’s and beer at Zeitgeist – we skipped alcohol at Zero Zero. The two pizzas we got – a plain Margherita and the California (wild nettles, sausage, burrata, inter alia) – were representative of what Zero Zero could do. As S says – “you can always tell how good a pizza restaurant is by their Margherita,” and Zero Zero did not disappoint (still, I prefer the Margherita “Extra” – with more types of cheese). But, the highlight of the meal for me was the California – all the ingredients complemented each other. As always, the crust was just the right amount of chewiness and crispiness, so there weren’t many pieces left for S to yoink. As many meals at Zero Zero often do, we ended with their organic soft serve. The Vanilla/Chocolate swirl for S and I, topped with cocoa nibs, which are the unsweetened, dry-roasted pieces of the cocoa bean – a bit bitter for my taste I think. We also tried MA’s soft serve, topped with the hot fudge and caramel – the hot fudge was like pure, melted chocolate-gold. 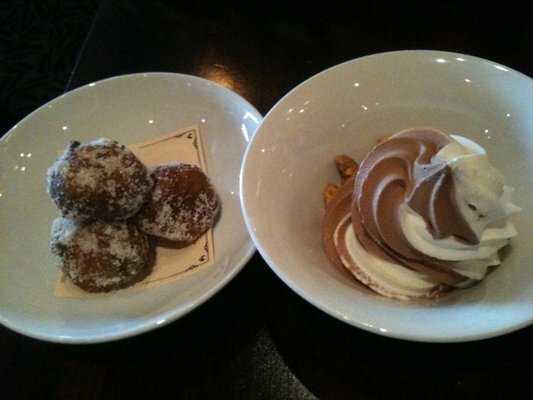 The ricotta doughnuts – a cross between doughnut holes and beignets – were decent, but nowhere near Just 4 You’s beignets. All in all, a great meal, and one that cost (all in) about $20/person. Not getting drinks likely helped a lot. I have a vague notion to try Zero Zero’s predecessor and sister restaurant, Pizzeria Picco, in Larkspur, but then again, I’d just as rather stay local and stick with what is close to a known (and solid) quantity in Zero Zero. This entry was posted in Italian, Restaurants and tagged Organic Soft Serve, Pizza. Bookmark the permalink.